OpenVox Communication a global leading provider of best cost effective open source Asterisk telephony hardware and software products, today announces to release its new GSM gateway – WGW1002G, the asterisk-based low density wireless gateway. The WGW1002G was designed to meet the needs of SMB by offering them low density (2-port) GSM interfaces with competitive price and small size. It takes full advantages of the stability and flexibility from the Voxstack VoIP gateway family in both performance and software. The WGW1002G supports 2 port GSM interfaces and it comes with the same functions as the Voxstack GSM gateways, developed for interconnecting a wide selection of codecs and signaling protocol, including G.711A, G.711U, G.729, G.722, G.723, G.726, GSM & SIP, to the GSM cellular networks to quickly reduce telecommunication expenses and maximize cost-savings. The new GSM gateway will be ready for worldwide shipping now. 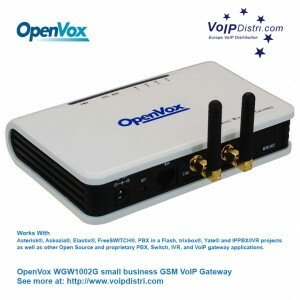 Please contact your sales representatives for your partner price or you can simply email us at openvox-voxstack@voip-gateway.net for any enquiries.